This article is presented as a sequel to "The Story of Arilbred Medians", which appeared in The Medianite in two installments in 2013 and 2014. Whereas the first article describes the history of the smaller arilbreds and the hybridizing work that produced them, this article will focus on the terminology for describing them and how they may be most effectively sorted into useful categories. The earlier article drew attention to two important types of smaller arilbreds that are most prevalent in the modern era. The first of these come from crossing SDBs with fertile arilbreds. These have a median height of 16 inches, and are the type most of us associate with the terms "arilbred median", "aril-median" or "aril-med". In terms of chromosome configuration, they are unbalanced tetraploids carrying one set of aril chromosomes, one set of Iris pumila chromosomes, and two sets of tall bearded chromosomes, represented as APTT. 'Eye to Eye' (Keppel, 2009, pictured left) may stand as an example of this type. About 148 of these have been registered from 1950 to the present (2016). The second important type comes from crossing SDBs with pure arils. These have a median height of 11 inches. I have refe rred to them as "arilbred dwarfs", although this is not a widely used term. They are triploids carrying one aril chromosome set, one pumila set, and one TB set: APT. 'Loudmouth' (Rich, 1970, pictured right) may serve as an example of this type. About 33 of these have been registered from 1950 to the present (2016). Fewer have been registered in recent years, probably because the most prolific hybridizers of small arilbreds today do not usually grow pure arils. In addition to these two major types, there are many smaller arilbreds without dwarf bearded species in their ancestry. In some cases, their small size derives from their bearded ancestry (which may involve diploid TBs, BBs, or MTBs). In other cases, the small size is a legacy of the aril species in their backgrounds, or a mixture of influences from both aril and bearded ancestors. Quite a few have also been produced from crosses that are more complicated, unknown, or difficult to categorize. Different approaches have been used to classify garden cultivars of irises (and, indeed, other types of plants as well). Broadly speaking, these systems can be either botanical (based on the botanical taxonomy of the species involved in their ancestry) or horticultural (based on the characteristics of interest to gardeners - height, season of bloom, flower size, and so on). The iris world knows both types of systems. The Aril Society International (ASI) has divided arilbreds into nine classes, based on the amount and type of aril ancestry (more precisely, the type of aril ancestry and amount of aril chromosome complement, which is related to ancestry but not exactly the same thing). 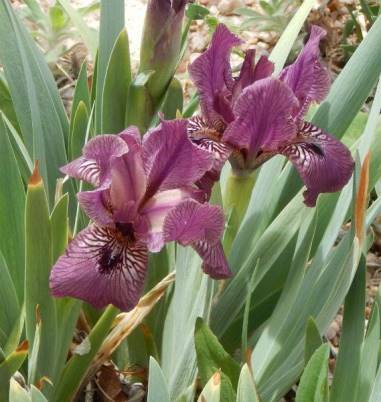 The bearded irises are divided into six classes based primarily on height, but also using season of bloom and flower/stalk dimensions as secondary criteria. Since the characteristic of most relevance to arilbred medians is height, I will for clarity refer to a horticultural classification as "height-based", and a botanical classification as "ancestry-based". So before we establish a classification system for the smaller arilbreds, we must face the critical choice of which of these two approaches to follow. Both have some advantages. Both have some problems. Since this choice is critical, I will take some time to outline the pros and cons of the two approaches. Both botanists and hybridizers are inclined to see an ancestry-based system as more logical and better representing the underlying relationships of the plants. Two plants with the same ancestry may differ visually in superficial ways, but they share an underlying affinity in their chromosome configuration, in their evolutionary origins, and in the fundamentals of physiology and internal structure. They are like family members who may have different hair color, but still share the same parents and grandparents, go to the same family reunions, and (usually) bear the same surname at birth. Botanists (and botanically minded plant enthusiasts) tend to be quite interested in relationships, rather than appearances. Hybridizers are interested in information that helps them plan future crosses, and ancestry does this, particularly as it implies chromosome configuration and genetic makeup. An ancestry-based system also ensures against "creep" of unrelated irises with different characteristics into an established class. For some MTB enthusiasts, for example, the tetraploids will always seem like intruders in the class, the essential qualities of which they see expressed best in the diploids. Likewise, many MDB enthusiasts are concerned with the preponderance of "small SDBs" being registered as MDBs based on height alone, without reference to bloom season, ancestry, or the overall character of the plants. Although ancestry-based systems do not completely ensure that a class will remain faithful to the ideals envisioned at its outset, they have an advantage in resisting "invasion" by irises of different background and different essential qualities. Some disadvantages to ancestry-based systems are pragmatic ones. What does one do if a parentage is unknown or questionable? What does one do when generations of breeding yield increasingly complicated pedigrees that become impossible to disentangle and sort into clean pigeonholes? And can one really impose scientific exactitude on the practices of hybridizers? The ASI classification of arilbreds technically requires a chromosome count in order to classify an iris properly, with no uncertainty. In practice, of course, hybridizers are allowed to use parentage and breeding behavior as proxies for chromosome configuration. That is not always as easy as it sounds, in cases where the chromosome configuration expected to result from a given cross is not obvious. There have been a fair number of errors in classifying irises under this system. An additional drawback arises if an ancestry-based system puts irises in a particular class based on "any amount" of a certain type of ancestry. In reality, a miniscule amount of ancestry has little or no practical consequence, and the system ends up often making "a distinction without a difference". Most OGB arilbreds, for example, are indistinguishable from OB arilbreds, even on a cytogenetic level. The distinction has become a pedantic complication devoid of meaning. An ancestry-based system does not usually adapt well to the development of new approaches to hybridizing, such as the incorporation of previously unused species or the emergence of new parental types from unexpected directions. When the SDBs were first developed from crossing TBs with Iris pumila, they closely resembled the dwarf species Iris lutescens, both in chromosome configuration and in general appearance. Yet in the ancestry-based system used at the time, the SDBs could not be called dwarfs; they had to be classified as intermediates, because they came from a dwarf species crossed with tall beardeds. The rigidity of this system in the face of new hybridizing developments seemed to fly in the face of common sense. To sum up, ancestry-based systems are a natural and logical way of expressing relationships between new hybrids and their ancestors, particularly during the time when the initial crosses are being made, and pedigrees are clear and simple. They lack adaptability as breeding progresses, parentages become more complex, and new unanticipated directions are pursued. A height-based system is, as stated above, a horticultural system. That is, it addresses the needs of gardeners first and foremost. Height is a critical element in understanding how a plant will appear in the garden, and what uses it can be put to. Rock gardeners insist on small stature: MDBs suit them, BBs do not. TBs may be preferable along a long drive leading up to a house, while medians are better suited to a bed at the front door that is intended to be seen close up. It is not academic curiosity about their ancestral species that has kept iris sellers and growers talking about arilbred medians for all these decades, despite absence of official recognition. It is their horticultural distinctiveness from the tall arilbreds. We appreciate them for their small size, and we use them in different garden contexts, as we do medians. There can be little doubt that the largely height-based classification of bearded irises embraced by MIS has been a great success in promoting each of the median classes and establishing their distinctive qualities. Each class has its own devotees, and its own passionate hybridizers. When was the last time you heard an arilbred hybridizer wax eloquent over the virtues of RB- or OB+? These are just technical labels to most arilbred enthusiasts, not categories to be embraced or models of esthetic composition to be strived for. One disadvantage of a height-based system is also readily apparent, and has been noted from the beginning of its use for bearded irises. The separation of similar irises based on minute differences in height seems arbitrary. Why is 28 inches a TB and 27 inches a BB? The distinction seems especially unhelpful when both may turn out growing anywhere from 24 inches to 32 inches or taller, depending on climate, weather, and culture. Such a system can also toss together irises of different background and invite unfair comparisons between them. And let's be honest: height-based systems put pressure on hybridizers to "tweak" the height measurement of a borderline iris to put it into the class where it might be expected to be more popular, due to less competition or an audience with different priorities. Conversely, some hybridizers feel pressured against registering irises near the height boundary, for fear it will be criticized for being "out of class". To sum up, a height-based system sorts things into categories relevant to gardeners, on the basis of simple measurements than can be performed without any technical expertise. It provides a place for all irises, even when parentage is unkown, questionable, or complex. These systems rely on line-drawing, which is always somewhat arbitrary and can seem artificial. One might imagine combining both systems to get the best of both worlds. This can work if done in a very limited way with great care. ASI imposes one horticultural requirement on its otherwise ancestry-based system: an iris must show two aril flower characteristics to be considered an arilbred. An "entry requirement" like this can work, but a general conflation of the two types of criteria usually fails miserably. At one point, the AIS divided dwarf, intermediate, and tall bearded categories by height, but also listed the species that qualified as dwarf or tall, and stated that intermediates where defined as hybrids between the two groups. But there were numerous instances where the height criteria and the ancestry criteria did not align neatly, rendering the whole system unworkable. Which System is Best for the Small Arilbreds? This is inescapably a question that different people will answer differently. I favor a height-based system, for reasons grounded largely in the relative success of the horticultural classification of bearded irises, which has promoted enthusiasm for each of the classes and proven adaptable to increasingly more varied and involved types of breeding. In contrast, I think the ancestry-based system used for arilbreds remains a largely esoteric exercise that is not easily understood and has led to little special appreciation of any of the nine classes it uses. 1. An ancestry-based system was employed in the first Checklist of Arilbred Dwarfs and Medians, which I compiled and published in The Medianite in 1980. An iris with only dwarf and aril ancestry was called an arilbred dwarf (ABD), and an iris with aril, dwarf, and TB ancestry was called an arilbred median (ABM). This was a convenient expedient, especially for historic varieties (now almost all extinct), for which height data was not available, but parentage generally was. Some problems were immediately obvious. One such problem was alluded to above: Iris lutescens being considered a dwarf, but the very similar SDBs being considered medians. Both produced similar progeny when crossed with arils, which would sometimes be classed as ABDs and sometimes ABMs, a meaningless distinction. Other problematic examples of this sort arise: is Iris aphylla a dwarf or median? How much dwarf ancestry has to be present for it to count? What about MTBs and BBs, which are medians but have no dwarf ancestry? 2. Complex breeding projects have been undertaken for smaller arilbreds, and many continue today. Although the SDB x aril cross, typified by 'Loudmouth', is my model of the ABD class, there are also fertile ABDs from crossing Iris pumila with tetraploid arils and infertile ABDs from crossing Iris pumila with arilbreds. The fertile ABM 'Anacrusis' resulted from an arilbred whose only bearded ancestry came from the dwarf species Iris suaveolens, but then crossed with an arilbred from only TB breeding. Its descendants are farther removed from the original dwarf parent, but otherwise similar. Use of Iris aphylla and tetraploid MTBs also promises fertile arilbreds, although such work is still in its infancy. Increasing fertility in IBs in recent years means these will likely become involved in ABM breeding, with uncertain consequence. There is no way for an ancestry-based system to gracefully accommodate all this variety in breeding, and this is a situation that will become more prevalent in the future, not less. 3. On the other hand, the arbitrary nature of line-drawing in a height-based system becomes more acute with the arilbreds, since there are many arilbreds with no dwarf or median ancestry that are smaller than TBs; in fact, many are shorter than 24 inches. The overlap between these and arilbred medians from SDB x AB breeding is a cause of difficulty in establishing an upper height limit for ABMs. The classification of bearded irises of course faces similar problems of overlap, but they are less frequent and less likely to be contentious. I actually see some advantage in classifying the smallest ABs from TB breeding as arilbred medians, since many of these are fertile and present a new avenue for creating fertile arilbred medians, should their potential in this regard be recognized. 4. Because 50 years or so has elapsed since the need for arilbred median categories became apparent, there have been conflicting definitions used and little consistency in how these irises have been described, promoted, and noted in registration data. This means any decision to stabilize the terminology and establish definitions at this point is likely to go against someone's preconceptions of what the category is about. (Many someones, most certainly.) But this problem will only get worse if we do not "come to terms." Having decided that a height-based system, with its admitted faults, is preferable to an ancestry-based one, we now have to decide how many classes there should be, and where their height limits should be set. I believe that the arilbred dwarfs from SDB x aril breeding (and from other crosses resulting in similar plants) are sufficiently distinctive to warrant their own class. They fill a garden niche similar to that of the MDBs and SDBs, forming cushion-like clumps, whereas the arilbred medians from SDB x AB breeding (and other crosses) are more reminiscent of IBs. Some people have imagined that such thinking will lead to a whole system of arilbred classes corresponding to the bearded classes MDB, SDB, IB, MTB, and BB. This is not the case; those classes each arise from particular types of breeding that were undertaken in the bearded irises. The types of breeding used to create arilbreds are different, and there are no actual analogs to each of the bearded classes. The proliferation of classes beyond ABD and ABM would have no theoretical basis and no practical value. 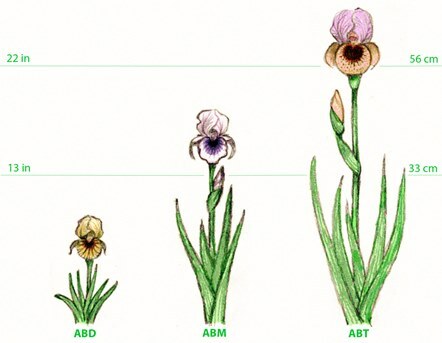 Although the height limits of the ABD and ABM classes will need to accommodate irises of many different types of ancestry, the limits should be set to give the familiar APTT (SDB x AB) and APT (SDB x aril) irises natural categories in which to reside. The upper height limit of the ABM class also needs to be set with an awareness of the considerable overlap between the APTT types and arilbreds whose bearded ancestry is solely from TBs. diploid aril (AA) x SDB (PPTT), the standard "arilbred dwarf" cross, gives APT. halfbred arilbred (AATT) x SDB (PPTT), the standard "arilbred median" cross, gives APTT. Let's first address the boundary between ABDs, represented by the APT chromosome configuration (blue line), and the ABMs, represented by APTT (green line).These curves cross around 13 inches, and this seems the obvious dividing line. There are still a number of APTs taller than this, including a curious peak around 20 inches. But I don't think anyone would have qualms about placing these in the ABM class. Finding the best dividing line between the ABM class and the remaining tall arilbreds (which I shall call ABT for the sake of clarity here) is a more involved task. These curves do not cross clearly at a single point, but rather are quite similar throughout the 20-22 inch range. This represents a difficult judgment to make, since there are a substantial number of APTT, AATT, and ATTT irises whose classification will be affected by the placement of the height limit. The rationale used is to minimize the probability that an iris will be placed in a class that is counterintuitive with respect to its chromosome configuration. We would expect APTT irises to be classed as ABM, and expect AATT and ATTT irises to be classed as ABT. The best height limit is the one that minimizes the chance of a "misplacement" for both types. The following table shows how the rate of misplacement changes with the height limit chosen. If the boundary is set either between 22 inches and 23 inches, or between 23 inches and 24 inches, the total of the percentages misplaced is minimized. 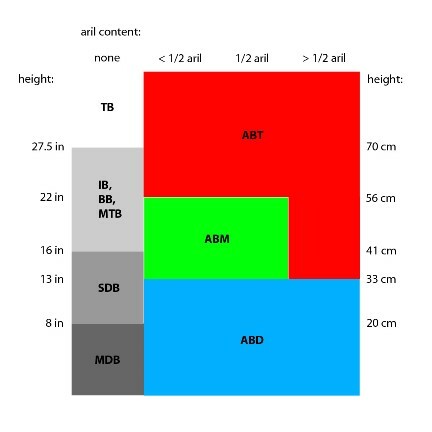 At 22.5 inches, 12% of APTTs are misplaced into the ABT class and 11% of the AATTs and ATTTs are misplaced into the ABM class. These percentages are reversed at 23.5 inches, but the average remains the same (11.5%). Moving the line either up or down from this "sweet spot" results in a higher percentage of irises assigned to the counterintuitive category. In view of the fact that the total number of AATTs and ATTTs is considerably greater than the total number of APTTs, it seems sensible to favor them slightly and set the height limit between 22 and 23 inches. How should we think about the "misplacements", as I have called them? We must keep in mind that these irises are "misplaced" only with respect to what a hybridizer might expect, given their parentage. In a height-based system, they are not wrongly classified, they are just classified in the appropriate height class. No height limit is "wrong", but the height limit that minimizes such departures from expectation is the most congenial and the least disruptive to those accustomed to thinking in terms of parentage. Those familiar with the 1996 revision of the Checklist and the accompanying article "The Smaller Arilbreds" (The Medianite, vol. 38, no.3) will note that this analysis is similar to that employed in that earlier publication, but that the upper height limit for the ABM class has increased from 20 inches to 22 inches. Three factors produced this change. (1) In the earlier publication, I used a random sampling of the AATT and ATTT height data, whereas the present analysis uses all the available data. (2) I had previously included arilbreds with more than ½ aril complement in the analysis, even though I excluded them from the ABM class. This inconsistency introduced a small bias toward a lower height limit. (3) Most importantly, the twenty additional years of data have changed the distributions slightly. In particular, the median height of APTT irises has increased slightly. These arilbreds, those in the OB+, OGB+, and RB+ categories used by the ASI, require special consideration. In terms of chromosome complement, they are mostly AAT or AAAT. Many of these irises are small in height, not because of their bearded ancestry, but because the aril irises themselves tend to be small in stature, and these arilbreds are mostly aril. It would be a mistake to place them in the ABM category, when their affinity is more with the pure arils, both in ancestry and in garden effect, than it is with the medians. Therefore, the ABM category is best limited to irises of ½ aril complement or less. In contrast, it seemed worthwhile to extend the ABD category into this realm, as a few have been produced in this range that are ¾ aril and ¼ I. pumila (AAAP), and do show their dwarf heritage. Only one AAT iris (and no AAAT) has been registered at less than 13 inches, so extending the ABD class into this range causes little disruption. The diagram below shows how the bearded irises and arilbreds can be sorted based on height and aril content. And Now for the Definitions! ARILBRED DWARF (ABD): any arilbred with a registered height less than 33 cm (13 inches). 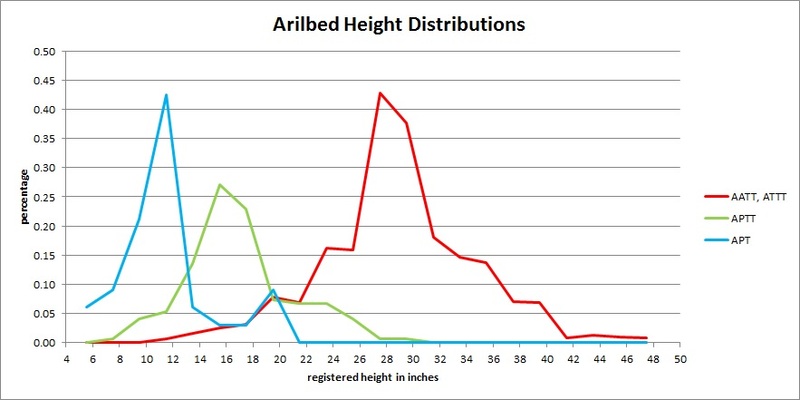 ARILBRED MEDIAN (ABM): any arilbred of one-half aril complement or less, with a registered height between 33 and 56 cm (13 and 22 inches), inclusive. ARILBRED (TALL) (ABT): any arilbred with a registered height greater than 56 cm (22 inches), or any arilbred of more than one-half aril complement with a registered height of 33 cm (13 inches) or greater. Some have wondered why these terms are used, rather than simpler ones like "aril-median" or "aril-med". The main reason is that the terse terms can be misleading about the nature of the plants. The ASI has long made a concerted attempt to educate people that the term "aril" should be reserved for pure arils, oncocyclus and Regelia species and hybrids involving only those two groups. "Arilbred" is the correct term for any hybrid involving the bearded irises as well as arils. The terminology defined above makes this explicit. One might argue that "aril-median" can be taken to mean a hybrid between a pure aril and a median, but this does not describe the ABM irises to which the term is usually applied (they are hybrids between arilbreds and medians), and in any case confounds the basic premise of a height-based terminology, which does not refer to ancestry. It is my conviction that these definitions, although not without some drawbacks, represent the best possible solution to the problem of classifying the smaller arilbreds that can be achieved at this time. They are based on a clear line of reasoning and factual data about the plants themselves. The ASI has included them in its proposed revision to the aril and arilbred chapter of the AIS Judges Handbook, not as official categories for registration and awards, but as useful terminology for understanding the types and variations of arilbred irises. It is hoped that hybridizers, commercial growers, and the public will also find these definitions helpful and embrace their use. It is important that we come to a common terminology. If the terminology proposed here is to become widely accepted, it is essential that people understand the philosophy and research behind these particular definitions. This article is intended to explain the rationale and honestly present both its virtues and its shortcomings. Although I believe a height-based system is best suited to cope with the present realities and potential future developments of the smaller arilbreds, I appreciate that it will present some initial discomfort for those accustomed to thinking in terms of parentage alone. I draw attention back to the classification system for median irises, which can produce similar discomfort in regards to irises that push the boundaries of their class, yet the system as a whole remains effective and useful. We should also remember that the gardening public cannot be expected to care about parentage or the technicalities of hybridizing. Rather, their need is for terms that reflect the differences one actually sees in living plants in the garden. 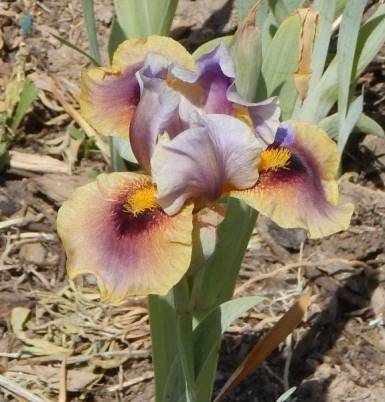 I encourage everyone interested in these irises to avail themselves of the Checklist of Arilbred Dwarfs and Medians, which I maintain and make available on my website. This is an important resource for understanding how these definitions are applied in practice to specific irises. The scope of that work is intentionally wide; it includes not only irises that meet the proposed definitions above, but all arilbreds with dwarf or median ancestry, and even irises with aril ancestry that were registered in the dwarf or median classes, rather than as arilbreds. Although no change to the official classification system for arilbreds is proposed at this time, it is hoped that the promotion of a uniform terminology for discussing the smaller arilbreds will result in an enhanced appreciation of their distinctive qualities and promote a wider recognition of their value and potential as garden subjects. "The Story of Arilbred Medians", The Medianite, 2013 and 2014. The Aril Society International Illustrated Official Checklist 2012, Joseph Stringham, editor. Aril Society, 2013. Registrations and Introductions, American Iris Society, annually through 2016. A Checklist of Arilbred Dwarfs and Arilbred Medians to 1979, compiled by Tom Waters (Tom Little), The Medianite, vol. 21, no. 1, winter 1980. A Checklist of Arilbred Dwarfs and Arilbred Medians Through 1996, compiled by Tom Waters (Tom Tadfor Little), The Medianite, vol. 38, no. 3, fall 1997.